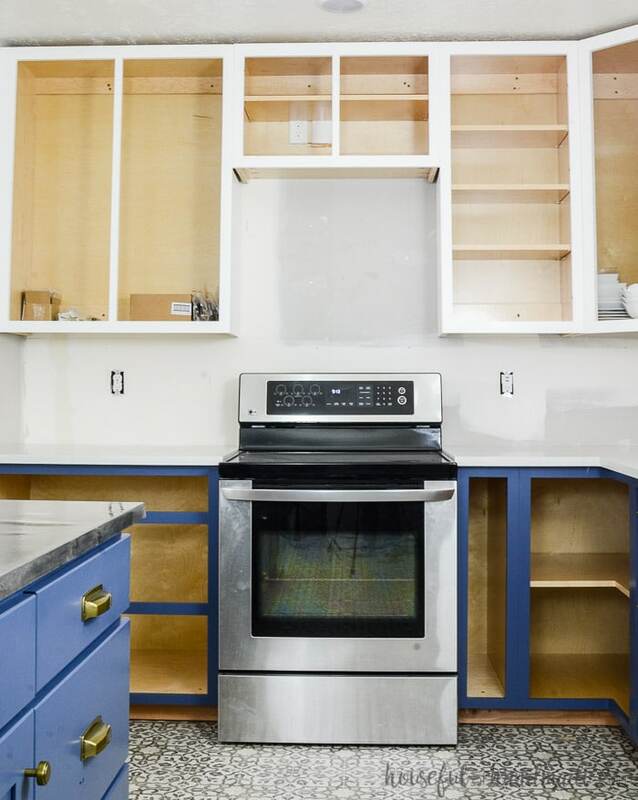 Learn how to paint unfinished cabinets to get the kitchen of your dreams. 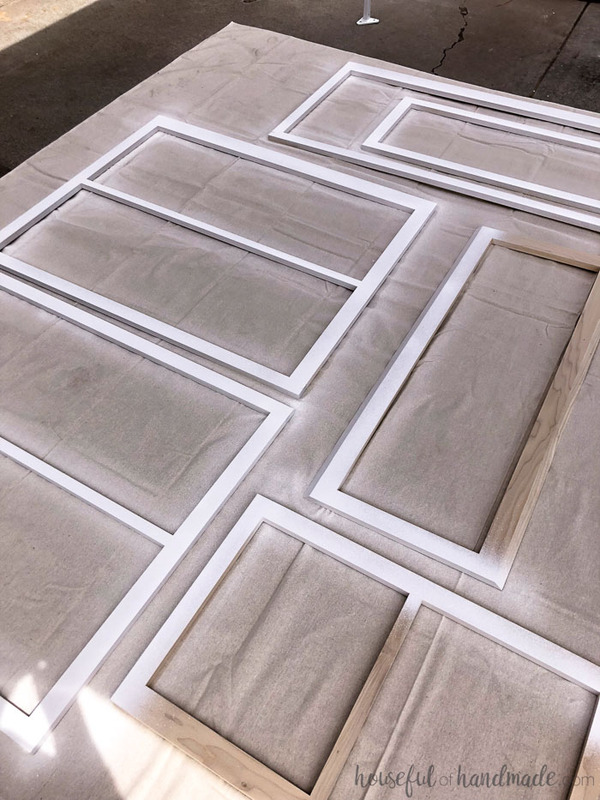 Whether you built your own cabinets, or buy unfinished cabinets to save on money, you will need to finish them properly to withstand the wear and tear of a daily life. Remodeling a kitchen can be expensive, but there are ways to greatly reduce the cost. 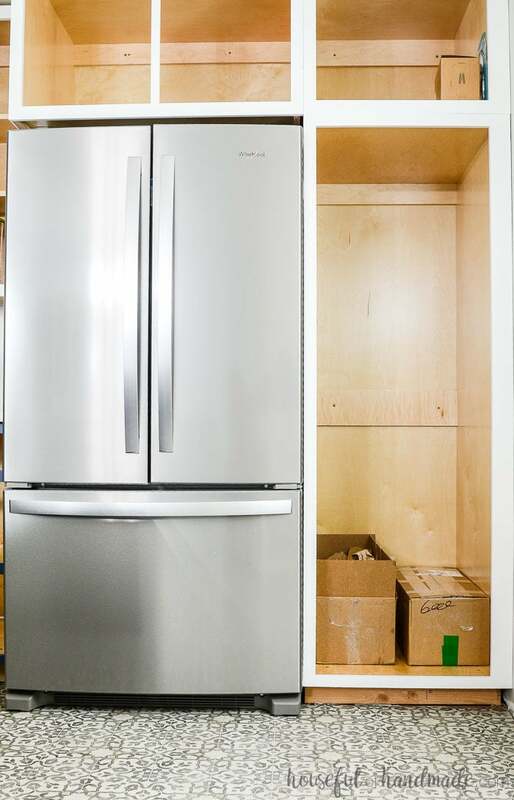 Since kitchen cabinets are usually the most expensive part of a remodel, building your own or buying unfinished cabinets is a great money saver. For our budget kitchen remodel, we went with the build-your-own route. But of course you need to know how to paint unfinished cabinets so that they can withstand years of abuse. So I partnered with HomeRight and used their new Super Finish Max Extra paint sprayer to obtain the perfect professional finish on our new cabinets. This post contains some affiliate links for your convenience. I may earn a small commission from these links, but you will never pay more by using an affiliate link. Click here to read my full disclosure policy. If you have not been following along, we are remodeling our kitchen in just 5 weeks as part of the One Room Challenge™ hosted by Calling it Home. Check out the previous weeks here, here, here, and here. Just 4 weeks ago, we ripped out our dated, 1979, builder-grade kitchen. I cannot believe how far we have come and the biggest transformation are the tall, beautiful, painted kitchen cabinets. 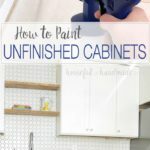 And even though all the cabinet doors are not ready or installed, I am excited to share how we painted our unfinished cabinets to help keep our budget in check. 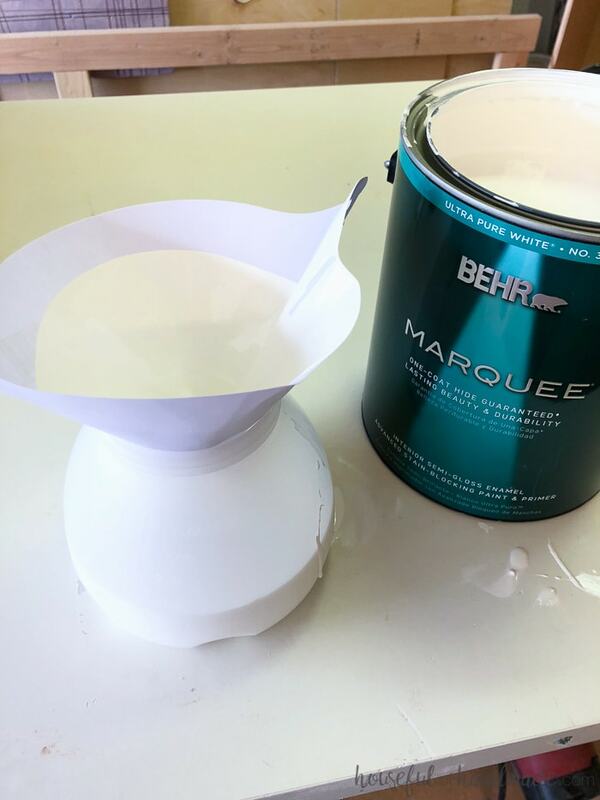 Why choose a paint sprayer over other painting methods? First, paint sprayers give you a very even finish with no visible brush strokes. 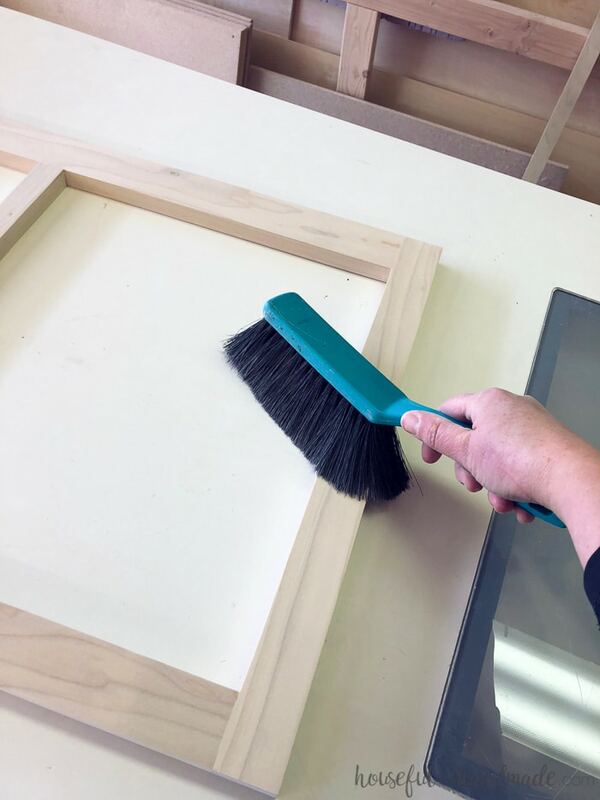 This is especially important if you are trying to paint unfinished cabinets during warm weather because your paint will dry faster leaving more brush strokes. Also, spraying lots and lots of cabinets is so much faster than using a roller or paint brush. And my favorite, the paint sprayed paint dries super fast. Which means you can start on the second coat almost immediately after finishing the first. Most cabinets are comprised of a cabinet box, face frame, and then the door or drawer front to cover the opening. For our cabinets, we used pre-finished maple plywood to build the cabinet boxes. This meant we did not need to paint or finish the boxes which saved a lot of time. It also means the insides of our cabinets are light wood and not the color of the face frames and (soon to be) cabinet doors. 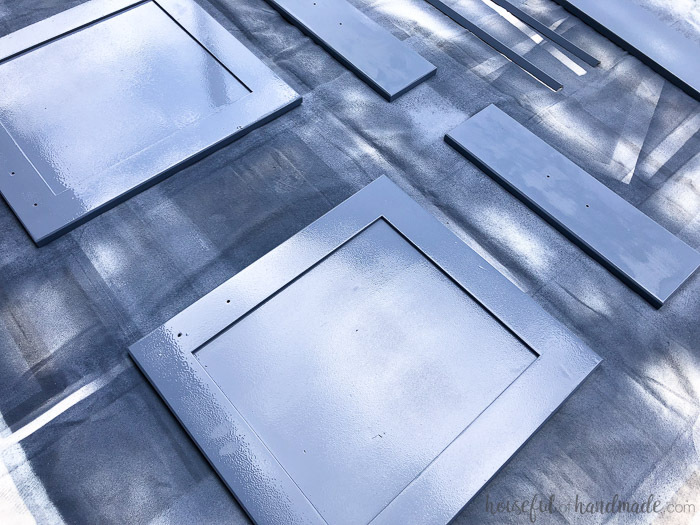 Depending on your kitchen cabinets, you might need to paint the cabinet boxes as well. But a paint sprayer will definitely help speed up that process too. Because we were only painting the face frames and cabinet doors, we painted them before attaching them to the cabinet boxes. Also, when painting the face frames separate from the cabinet boxes, you need to not paint the back of the face frames. 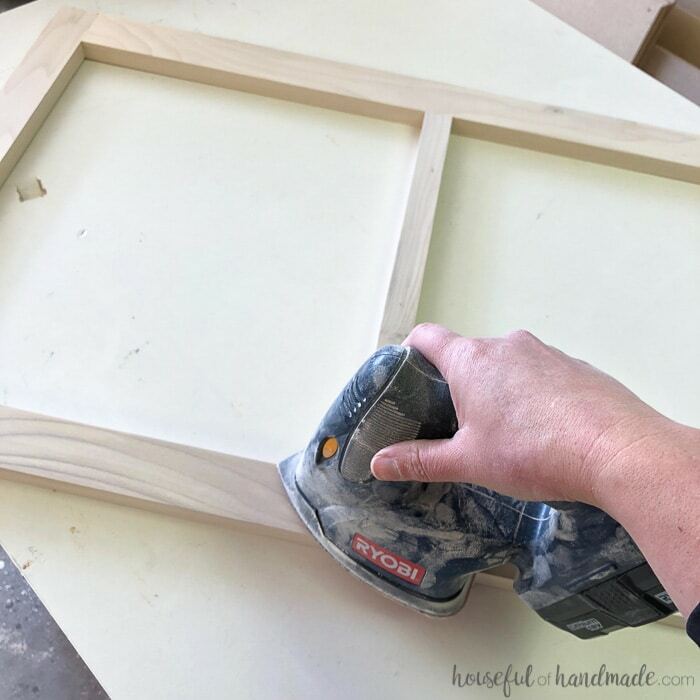 You need to have unfinished wood on the back for the wood glue to adhere to when attaching them or the face frames will not be secure. An amazing paint job happens before you ever start painting. It happens even before building. It all starts with proper wood choice. For kitchen cabinets that can withstand years of use, you want to use a hardwood for the face frames and doors. 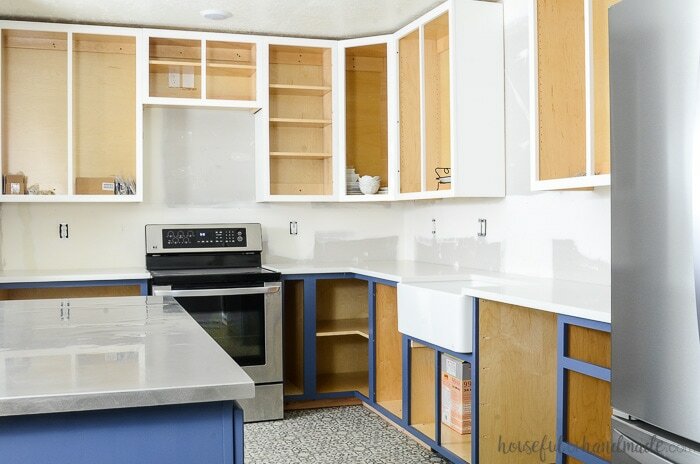 Most places that sell unfinished cabinets will only offer these choices. Hardwoods do cost a bit more than soft woods like pine, but they are totally worth it. For our kitchen cabinets, we went with poplar. It is a softer hardwood that is easy to work with and inexpensive. It does have a slight green ting to the color, but is great for furniture you are planning on painting. Once you finish building your cabinets, you will need to sand them. If you are purchasing your cabinets, you probably will not have to do this step, but check them to make sure they are nice and smooth. Sand all the surfaces so they are smooth with a medium grit paper (80-100 grit) and work your way down to 220 grit for the last sanding. Improper sanding will magnify any imperfections in the wood. After sanding, brush or vacuum off any dust. Then use a tack cloth to get any remaining dust off the surface of your cabinets. Tack cloths are my new best friend. Luckily they are cheap. Now you are ready to paint your cabinets. 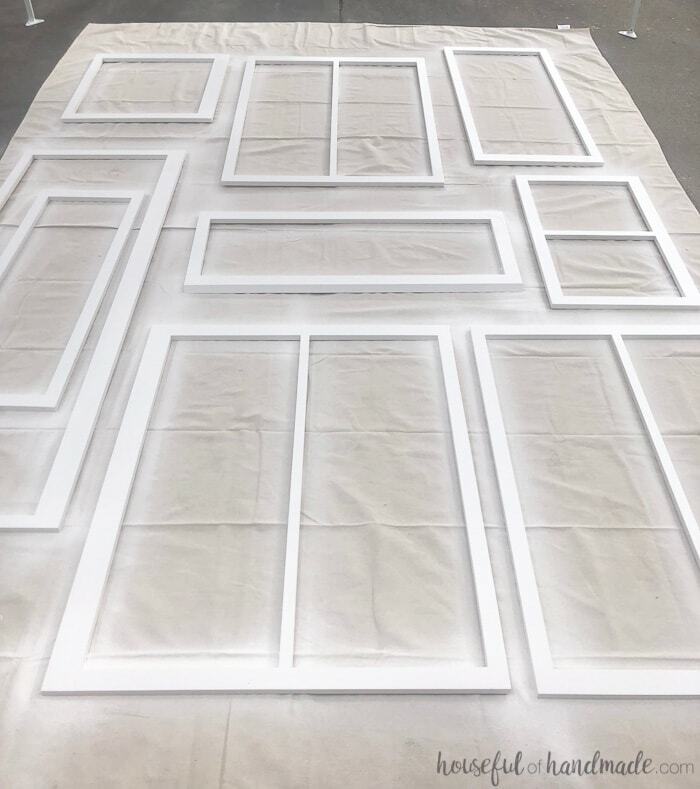 When you are painting a lot of cabinets, you want to do as many at a time as possible. I have the HomeRight spray shelter and love it, but it just wasn’t big enough to hold multiple face frames or doors at once. Instead, I made my own spray tent. We use a 10’x10′ easy up tent (which we have been wanting to buy anyway for shade at the lake and parties). 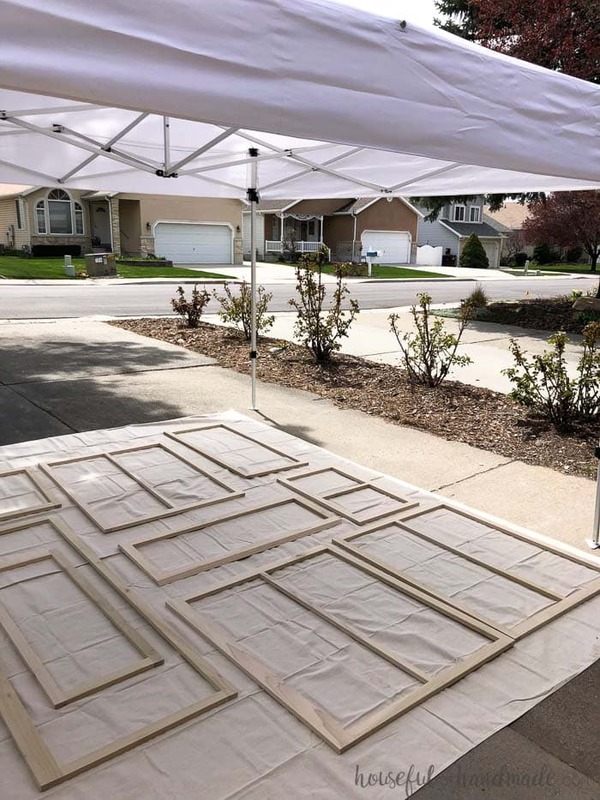 The side panels are great for adding to the sides where any breeze might be coming in, but leave the others open if possible for lots of fresh air. Then on the floor, I used a 9’x12′ drop cloth. This gave the cabinets a nice place to sit and protected my driveway from overspray. After wiping all the face frames down with tack cloth, I laid them out on the drop cloth. It took a little bit of my Tetris skills to get them all to fit with enough room for me to move around them, but I managed. Once all the face frames were ready, it was time to prepare the sprayer. 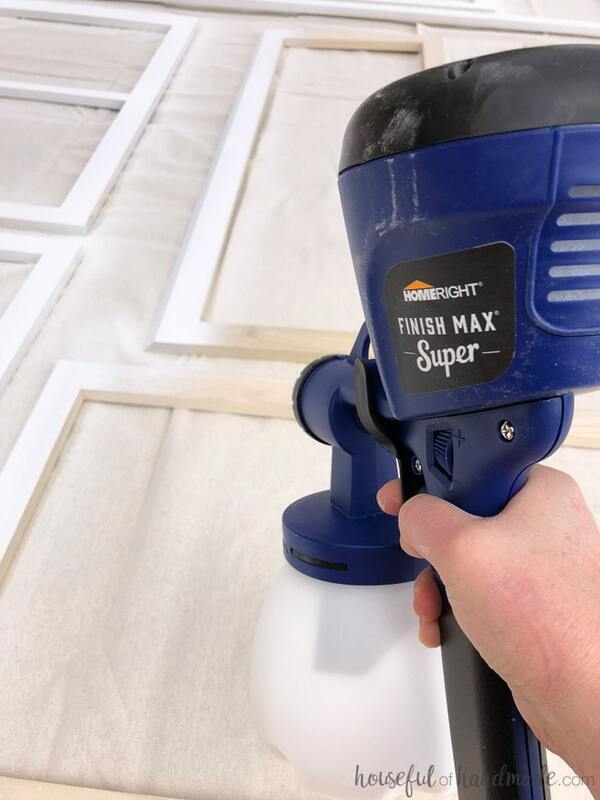 I love the HomeRight Super Finish Max sprayer for painting cabinets because it is inexpensive but gives you amazing results. You can easily change up the direction of the spray, spray at all angles, and the clean up is a breeze. And since you can use pretty much any paint, you can pick pretty much any color. We used Behr Marquee paint in Polar Bear and Durango Blue for our cabinets. It is not necessary to thin the paint before spraying with the Super Finish Max sprayer, but I noticed I got a smoother surface when I thinned it a little bit. Since the paint we used was water soluble, I thinned it with just a little bit of water. I thinned the paint about 15%-20%. It was not super scientific, I used plastic cups to scoop the paint into the FinishMax sprayer container, and for every 2 cups of paint, I added about 1/2 cup of water. Stir until it is nice and smooth. 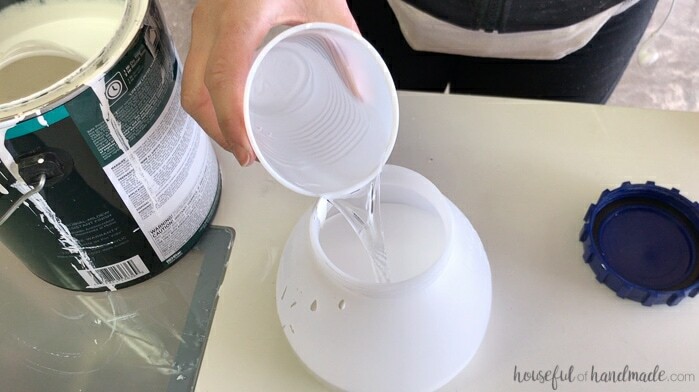 If you are using older paint where you might have dry bits or things that have fallen into the paint, I recommend straining it into the paint sprayer container so none of those can clog up the machine. You can use these easy and inexpensive paper cones to do it. Once the paint is ready and in the sprayer, it is time to turn it on. Start the sprayer and check the paint flow on an empty section of drop cloth. I preferred using a low flow for painting and a high flow for cleaning. You can adjust the Super Finish Max sprayer paint flow quickly by turning the dial behind the handle. I used an extension cord so I could easily move around the entire paint area inside my tent. When spraying you want to try not to stop or turn around over the surface to be painted, but instead go past the end of the cabinet and then stop or turn around. Turning and stopping can cause excess paint in that one area so best to have that over your drop cloth instead of the cabinet face. Take your time to make sure to spray every surface. It is best to do two thinner coats than one thick coat to prevent dripping. Once I got to the end of the first coat, the items at the beginning were dry so I gave them a quick second coat before cleaning out the sprayer. 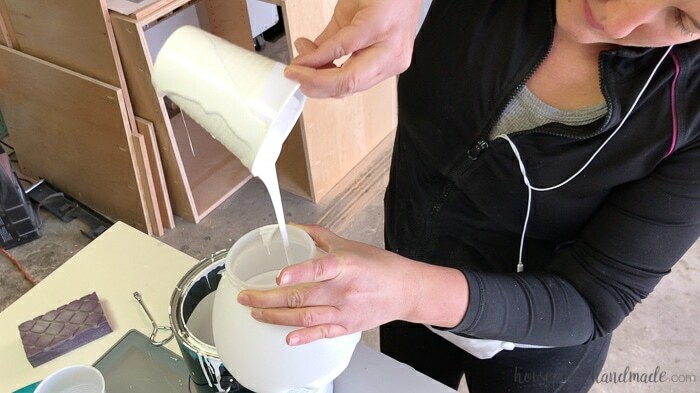 To clean out the water-soluble paint from the sprayer, rinse out the container, then fill it with warm water and a squirt of dish soap. Hook it back up to the power and spray the soapy water out of the nozzle. Use the brush to clean off the nozzle while you spray. Empty the entire container of soapy water then fill it with warm clean water and repeat. Okay, so technically this is the 3rd & 4th coats since we did 2 light coats as the first. But either way, we are preparing for the second spraying. 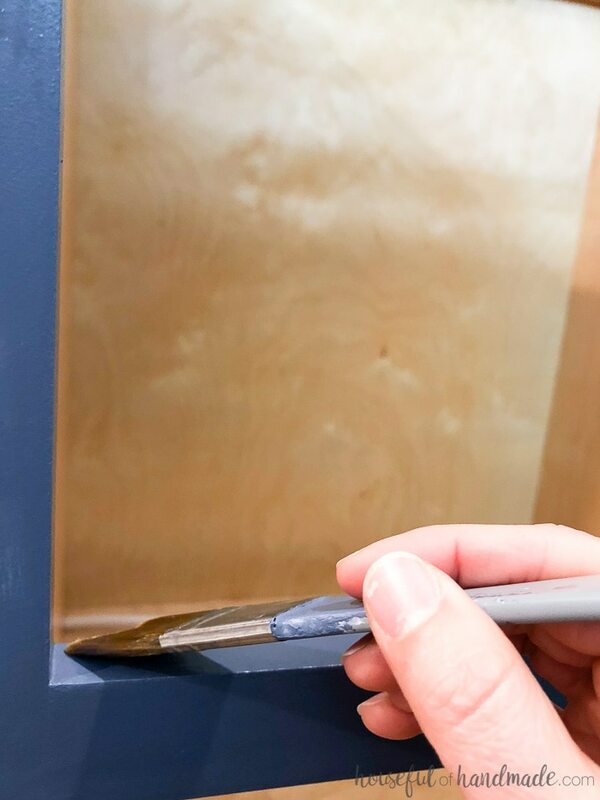 To get a super smooth and professional paint finish on your unfitted cabinets, you will want to sand the surface between coats. This seems a bit silly, but it is so important. 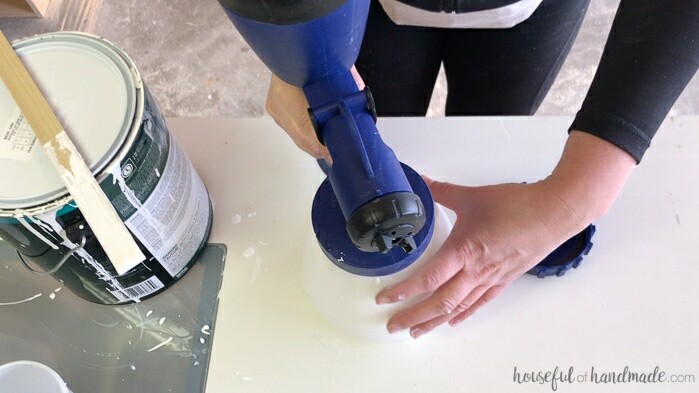 Use an ultra-fine sand paper (I love these sanding sponges) and give the entire surface a light sanding. Keep it light, there is no reason to remove the paint down to the wood, just remove any bumps and imperfections. After sanding, wipe down the entire surface with the tack cloth again. This will remove all that dust and you will be ready for the second coat. Repeat the painting the same as you did in the first coat. Again, it is better to do 2 light coats. Even though paint is pretty hardy, for a kitchen or bathroom, I love to apply a protective finish. This will seal the paint and wood in a glass-like clear paint and give it a really professional look. For stained wood, I love polyurethane protective finish, but for paint I always choose a polycrylic protective finish. Polycryclic finish will not yellow over time so it is the perfect way to protect your painted cabinets. Also, polycrylic will make the kitchen cabinets much easier to clean. You can choose a protective finish with a gloss, semi-gloss or satin finish. Typically gloss is easier to clean, but I tend to lean toward the satin finish because it is less shiny and more modern. 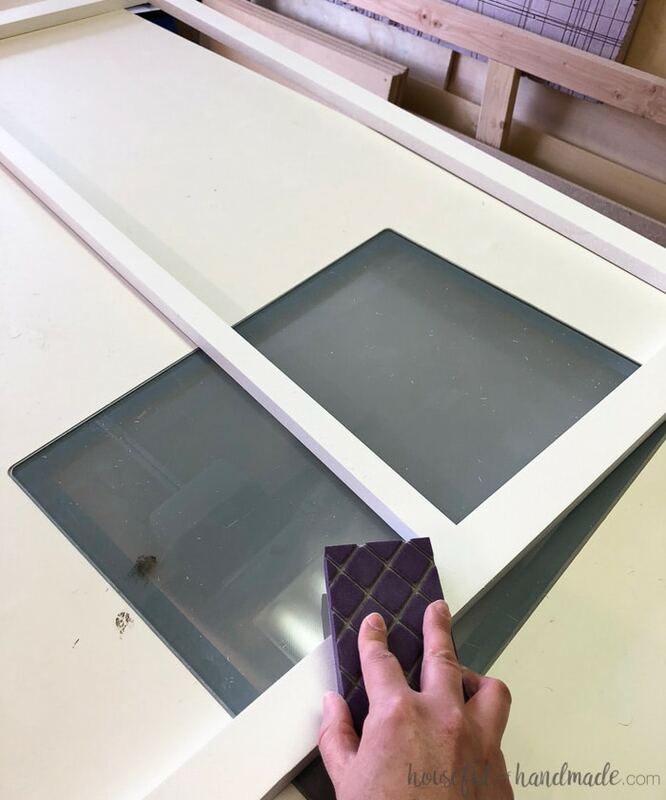 For the cabinet face frames, I chose to apply the poly coating with a roller after they were installed. I knew installing them would cause a few dings and leave me with a few nail holes to fill in. By apply the protective finish after installing, I was able to easily apply wood putty, sand and touch up paint before the protective finish was on to make it more seamless. However, you have to be careful with polycrylic finish because it can be finicky. Do not try over brush it. It dries quickly and will cause you to have visible brush strokes. I prefer using a foam roller to apply it to help minimize brush strokes. However, for the cabinet doors, you can apply the protective finish quickly with the Super Finish Max sprayer too! I chose a water soluble polycrylic coating so the cleaning was as easy as with the paint. Make sure to give the paint a couple days to fully cure before applying the coating so you don’t end up with permanently soft paint. 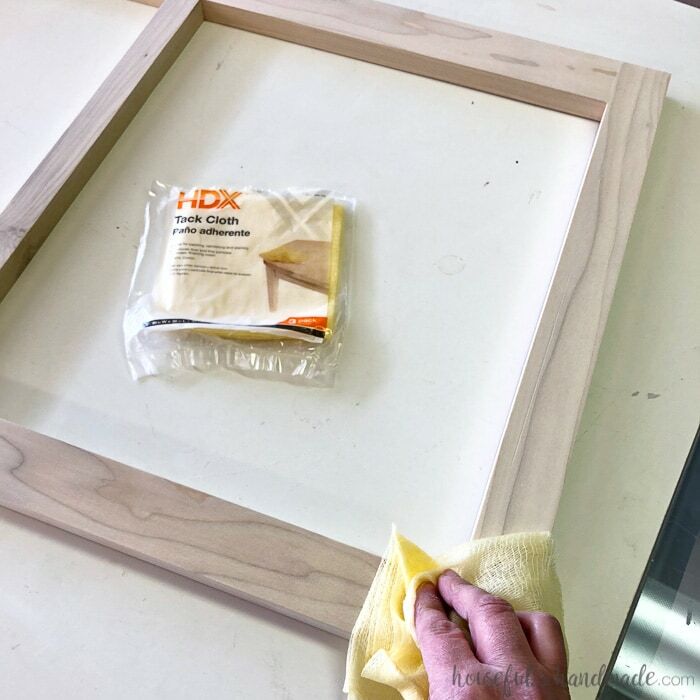 You will also want to remember your light sanding between coats to get that smooth glass-like finish. Now you have beautiful painted kitchen cabinets. Learning how to paint unfinished cabinets is a great option for keeping a kitchen renovation budget small. And the Super Finish Max sprayer from HomeRight made it quick(er) and easy. Now if only the weather would cooperate, those cabinet doors would be done and installed too. But then where would the excitement for the last week of the challenge be! And don’t forget to check out the rest of the beautiful One Room Challenge™ reveals. We are so close to the end and I cannot wait to see what everyone does! A great painting tutorial! I painted my cabinets blue for my own ORC (bath) project-it is always a bit intimidating to go bold. But your space is going to look great-best of luck during the last week! Thanks Kristin! Bold colors are scary, but they always look so fun! I’m really looking forward to the big reveal in this room. I really love your color choices and am considering something similar in my room.